A. – There is not a Kosovar nation. The people of the newly born state of Kosovo, in the Balkans, are Albanians, most of them emigrated from neighbor Albania in the last 60 years. The declaration and recognition of Kosovo as an independent state, a second state for the same nation – the Albanians, on the historic sovereignty of the historic ally of Russia – Serbia, was a major blow for Russia, which considers itself still a super power. It is not only a question of national pride, in Russia, especially in the Caucasus, there are several nations and communities, under Russian sovereignty, who deserve, by all definition, self determination and independency even more then the Albanians in Kosovo – the Chechens in Chechnya for example. B. – The American plan to deploy missiles defense system in East Europe, in the former hemisphere of the historical Soviet Union, is considered by Russia as a direct threat and as a cynical exploitation of the temporary weakness of Russia. C. – The close relations between Georgia in the Caucasus, 20 years ago still a part of the Soviet Union, and the aspiration of Georgia to be a part of NATO in the sensitive and fragileCaucasus is unbearable in the Kremlin eyes. Even more, a strategic new oil pipe line stretches from the reach oil fields of Baku, in Azerbaijan on the Caspian Sea, through Georgia, to the Black sea and diminishes the European dependency on Russian energy. Georgia is the in the right place where Russian interests cross and the twilight of Bush administration the right time to teach NATO and USA a lesson that Russia is able to shrike back at the time and in the Place chosen by Russia. 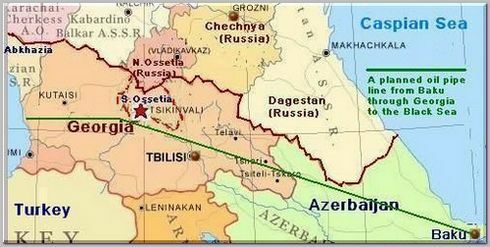 South Ossetia, similar to Kosovo, is also inhabited by Russian emigrants who emigrated from neighbor Russia in the last 60 years. Although South Ossetia is within the recognized borders of Georgia, the South Ossetia people have, according to Russia, the same right to self determination and independency as Kosovo. That right is implemented, with full Russian support and encouragement, also in another district of Georgia inhabited with Muslims – Abkhazia on the Black Sea. It is a perfect excuse for Russia, using the same arguments used for Kosovo, to provoke tension against USA ally – Georgia. By teaching Georgia a lesson and demonstrate who is still the landlord of the Caucasus Russia hopes to remove USA grip from the Caucasus and, at the same time, to establish a strong Russian presence south of the Russian border in the Caucasus and near the strategic oil pipe line from Baku to the Black Sea. Less then 48 hours after the conflict breached out, on 08/07/2008, it is already clear that Georgia did a big mistake by relying on Western powers. Russia is able to veto any UN Security Council resolution in regard with a possible cease fire in Georgia. The Western powers, already involved in remote wars in Afghanistan and Iraq and needs Russian support to cope with the Iranian threat, will not risk their relations with Russia by sending material support to Georgia. Georgia is left alone to find out that Russia is far to strong to cope with and for the sake of their global interest Europe and USA are about to abandon Georgia.